A small, black, short-coated dog with distinctive rich mahogany markings and a taper style tail. In structure the Manchester presents a sleek, sturdy, yet elegant look, and has a wedge-shaped, long and clean head with a keen, bright, alert expression. The smooth, compact, muscular body expresses great power and agility, enabling the Manchester to kill vermin and course small game. Except for size and ear options, there are no differences between the Standard and Toy varieties of the Manchester Terrier. The Toy is a diminutive version of the Standard variety. The Toy variety shall not exceed 12 pounds. It is suggested that clubs consider dividing the American-bred and Open classes by weight as follows: 7 pounds and under, over 7 pounds and not exceeding 12 pounds. The Standard variety shall be over 12 pounds and not exceeding 22 pounds. Dogs weighing over 22 pounds shall be disqualified. It is suggested that clubs consider dividing the American-bred and Open classes by weight as follows: over 12 pounds and not exceeding 16 pounds, over 16 pounds and not exceeding 22 pounds. The Manchester Terrier, overall, is slightly longer than tall. The height, measured vertically from the ground to the highest point of the withers, is slightly less than the length, measured horizontally from the point of the shoulders to the rear projection of the upper thigh. The bone and muscle of the Manchester Terrier is of sufficient mass to ensure agility and endurance. The Manchester Terrier has a keen and alert expression. The nearly black, almond shaped eyes are small, bright, and sparkling. They are set moderately close together, slanting upwards on the outside. The eyes neither protrude nor sink in the skull. Pigmentation must be black. Correct ears for the Standard variety are either the naturally erect ear, the cropped ear, or the button ear. No preference is given to any of the ear types. The naturally erect ear, and the button ear, should be wider at the base tapering to pointed tips, and carried well up on the skull. Wide, flaring, blunt tipped, or "bell" ears are a serious fault. Cropped ears should be long, pointed and carried erect. The only correct ear for the Toy variety is the naturally erect ear. They should be wider at the base tapering to pointed tips, and carried well up on the skull. Wide, flaring, blunt tipped, or "bell" ears are a serious fault. Cropped or cut ears are a disqualification in the Toy variety. The head is long, narrow, tight skinned, and almost flat with a slight indentation up the forehead. It resembles a blunted wedge in frontal and profile views. There is a visual effect of a slight stop as viewed in profile. The muzzle and skull are equal in length. The muzzle is well filled under the eyes with no visible cheek muscles. The underjaw is full and well defined and the nose is black. Tight black lips lie close to the jaw. The jaws should be full and powerful with full and proper dentition. The teeth are white and strongly developed with a true scissors bite. Level bite is acceptable. The coat color should be jet black and rich mahogany tan, which should not run or blend into each other, but abruptly form clear, well defined lines of color. There shall be a very small tan spot over each eye, and a very small tan spot on each cheek. On the head, the muzzle is tanned to the nose. The nose and nasal bone are jet black. The tan extends under the throat, ending in the shape of the letter V. The inside of the ears are partly tan. There shall be tan spots, called "rosettes," on each side of the chest above the front legs. These are more pronounced in puppies than in adults. There should be a black ""thumbprint" patch on the front of each foreleg at the pastern. The remainder of the foreleg shall be tan to the carpus joint. There should be a distinct black "pencil mark" line running lengthwise on the top of each toe on all four feet. Tan on the hind leg should continue from the penciling on the toes up the inside of the legs to a little below the stifle joint. The outside of the hind legs should be black. There should be tan under the tail, and on the vent, but only of such size as to be covered by the tail. White on any part of the coat is a serious fault, and shall disqualify whenever the white shall form a patch or stripe measuring as much as one half inch at its longest dimension. Any color other than black and tan shall be disqualified. Color and/or markings should never take precedence over soundness and type. Standard variety - Weight over 22 pounds. Toy variety - Cropped or cut ears. Both varieties - White on any part of the coat whenever the white shall form a patch or stripe measuring as much as one half inch at its longest dimension. Any color other than black and tan. Click Here to Learn about breeder background checks on Manchester Terrier breeders if you are looking for Manchester Terrier puppies for sale. Click Here to learn how ResearchBreeder.com can help you find healthy Manchester Terrier puppies for sale. Click Here to order a Breeder or Kennel Background Check on Manchester Terrier Breeders that may have Manchester Terrier puppies for sale. 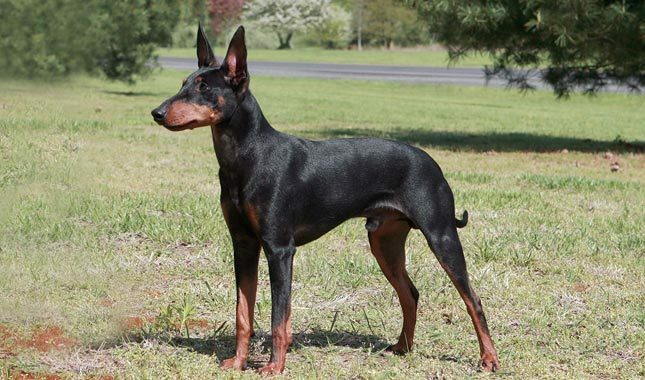 Click here to find the national breed club for Manchester Terrier puppies for sale. Click Here to purchase a list of approved ResearchBreeder.com Manchester Terrier Breeders who have Manchester Terrier puppies for sale.